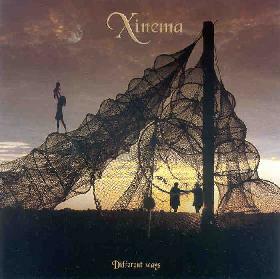 Xinema is a three piece consisting of Mikael Askemur (lead vocals/bass/keyboards/guitars), Sven Larsson (guitars/vocals), and Jonas Thurén (drums/vocals). They do short melodic songs with strong prog leanings. On first listening my impression was: Asia Clone (circa 1982). Mikael even has the mellow John Wetton vocals down. Like Asia, the songs are short: one track about 7 min, the rest are 4 to 5 min. Now that I’ve listened to this CD a few more times I like it. I haven’t changed my mind about the Asia thing, though I should mention that sounding similar to Asia is not a bad thing really. I liked Asia’s first album. So how is this different you might wonder. For starters the playing on Different Ways is very cohesive, a group thing. These guys played in a prog band together in the late 80’s (disbanded early 90’s). They got back together in about 1999 and formed Xinema. The reason I mention it is that their playing sounds like they’ve been together for awhile: very comfortable. The songs have a real laid back vibe, even when they approach some aggressive riffing. The vocals fit very well. Mikael is a very confident singer. The lyrics are fairly interesting. There are nice intricate instrumental touches throughout each song and they manage to showcase all the players without resorting to what I call "ego solos". What’s cool is that they manage to subtly cram each song full of intricate little bits, in what in prog is considered a short amount of time. Lots of nice little touches that show me that these guys can really play. I’ve also noticed that this CD continues to grow on me. I really like everything about this band: the singing, the playing, and the short songs that somehow work (for prog). Recommended. Different Ways is distributed by Unicorn Records. You can visit their web site at: http://www.unicornrecords.com. Contact via snail mail c/o Unicorn Records; PO Box 95016; Lorraine, Quebec; J6Z 4P1; Canada.